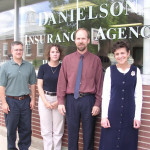 Established in 1934, our motto is “Insurance Is Our Specialty. Service Is Our Business” and our #1 goal is “quick and accurate service” for our clients. We are members of the Independent Insurance Agency System and can check with several insurance carriers so our clients receive the best coverage for their needs and lifestyles. We represent companies that are financially strong, offer excellent coverage at competitive rates and are fair in settling claims. We offer many types of insurance coverage including: auto, home, farm, business, recreational vehicles, life and health. We are able to service clients in MN, WI, IA, and AZ. Our agency is committed to providing our clients with friendly, courteous service. It is with utmost importance that our clients are provided with quality insurance products. This is central to our growth and success. We work hard to meet the needs of our clients. We feel it is important that our clients have a good understanding of their insurance coverage in everyday terms.